lower Essence Energy natural remedy sprays are created using high quality essential oils and flower essences from the wild. Our natural remedies for healing are safe and will not react negatively with other treatment modalities or medications. Each floral essence product has been developed by Maggie for a specific purpose. They are 100% natural, bottled by hand and guaranteed for one year from the date of purchase. Because the sprays can be used anywhere, we suggest you keep a set of your favorites at home, and in your purse, brief case or travel kit. May be sprayed around the head and body, or in any space. On the body: Close your eyes and mist about your head and body while breathing deeply. The flower oils arouse olfactory and skin sensations, the floral essences uplift your energy, promoting a sense of well being and calmness. MEMORY CARE KIT - NEW!! 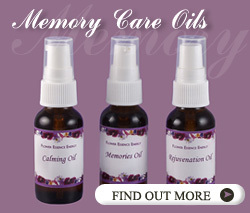 Explore our new line of Memory Care Kit page to find our more about Calming Oil, Memory Oil, and Rejuvination Oil specifically formulated for people dealing with Alzheimers and Dementia. A clinically proven blend to relieve anxious stress. First aid for panic attacks. Use when the first symptoms and signs of anxiety attacks are felt. A natural remedy for panic and anxiety. Take a deep breath expanding your lungs and as you exhale let the tension go. hen misted about the head and body, these Flower Essence Energy Sprays invite you to take a deep breath. The flower oils arouse olfactory and skin sensations. The essences uplift your energy. You experience a sense of well being and calm. You can choose to respond rather than react... to live in the moment. Click here to see Before and After aura photos. Inspiration supportive during the creation of his books. A reminder that your angels are loving you. Brings life into focus by calming the mind. Aroma: Bergamot, Sweet Orange, Vanilla. helps us let go of those childhood fears that stop us from expressing the elegance of who we have become. Clears any space of unwanted or undesirable energies. Allows healing energy to pervade. Uplifts the spirit in times of grief, depression and sadness. Quiets the mind, allowing creativity to flow. Lets you receive love that is always surrounding you. Allows you to bring your dreams and ideas into physical form. Breaks undesirable patterns in your physical and emotional bodies. Transforms depleted energy into calm revitalization. Revitalize your life. Assists you in going within to your private garden of peace. Can't sleep? Calms the busy mind and promotes sleep naturally. Helps your body remember how to sleep. Insomnia and other sleep problems melt away. Restores balance. Calms energetic children. Feeling safe, knowing you can trust your inner voice to guide you to the right answer. "7" Soul Connection brings us greater balance of being by our connection with source, quietly accepting our power while staying in our heart. "I LOVE your Creating Relationship formula and so does my husband! We both feel an immediate shift in our awareness!! More open, self-aware with a recognition that space is all around us - I feel the "fog" of our old patterns lift and new possibilities emerge! PS I have been with my husband for almost 40 years!"